Okay. 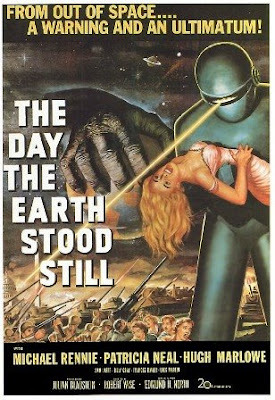 I already knew the movie wasn't really a remake of the original The Day The Earth Stood Still. As I've mentioned before, that 1950s movie was my all-time favorite from that era. Loved Michael Rennie. Loved the idea that humans were finally reaping our not-so-instant karma from our war-mongering ways. (Why are we humans so fascinated by war and fighting and weapons and other horrible things? What's the matter with us? Aren't we ever going to evolve into a higher consciousness? Even watching the adolescent-male-focused previews of coming attractions with all the us vs them made me sick and depressed.) But, even though I made allowances for everything this movie couldn't possibly be, I expected more than . . . nothing. How incredibly lame. No plot. Terrible acting. A crappy ending that made me say "Huh?" out loud in the theater. I went to the $5 show and considered it a waste of $5. I'll hold onto my black and white original and will cheer as intellect overcomes brute force. The greatest thing I liked about the movie was GORT. Other than that...yeah it sucked. Oh, I hate movies like that. No fun at all. Thanks for the warning, I won't waste my time. Remakes of classics just never make the cut. BTW Lynda you've been nominated. The only thing I remember from the movie is Keanu in that suit. And omg that's all I really need to remember. Yum. That is so disappointing, Lynda, but like you, I really didn't think this one would be anything like the original. That was a classic that will live on forever! Thanks for the warning. I won't waste my money or time. Mya: Yeah. gort was kinda cool, but it couldn't offset the suckiness for me. Judith: Well, others seem to like it (I read a bunch of reviews). I just couldn't see any reason for it to have been made. Emma: I think Keanu is a cute guy. I've found him attractive in other movies. But this time he left me cold. Susan: Maybe rent it when it leaves the theaters in ten minutes. Wow. I really have a bad attitude about this movie, don't I. See what happens when they mess with greatness?